I'll use PyAI to debug, see if there is anything I can find. Hmm the game that you describe is different than what I see. Any ideas what could cause the difference? Here's a screen shot of the game I see. I get a freeze on a different map, AIvsAI TvZ Byzantium 2.3. So at least I can look into what is causing it. Here's what I have at 14:29. Just to make sure, these are the exact scripts I'm using. Ah you have Avance v1.03 the one I got from the launcher is v1. Correcting that I now get the same behaviour. As I'm noticing from BWAIWARV, your AI seems to do much better against protoss than zerg, even though it's designed for Zerg. This is because your AI doesn't attack within the first 12 minutes or so, allowing Zerg to mass drones and such, able to get a huge economy. When the Accel_T finally moves out, it's army is pretty cost effective, however eventually it loses its army. 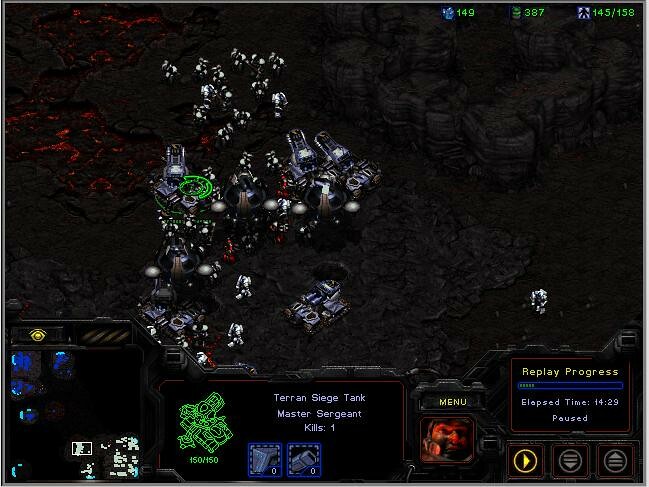 Then Zerg can just produce units en masse and run over the few units that are at home base. You'll need to change something about the TvZ matchup, whether against a human or AI, if you want it to be better and more effective. I agree, it might do better with many small attacks rather than a few big ones so that it applies more pressure and is less vulnerable to run by. The freezing issue seems to be due to the if_owned command running in the thread controlling the second expansion. Replacing if_owned with equivalent form of notowns_jump appears to get rid of the freezing. I played your AI in TvT just for fun (I'm absolutely terrible at Terran). And then I looked at the replay, and I noticed there were a ton of idol SCVs at the natural sometimes (5-6 SCVs sitting in the middle of the mineral line). Also, it seemed to have floated a lot of minerals. What was the AI script that you used? I've tried both 1.52 and 1.53 and they don't seem to line up with your replay. 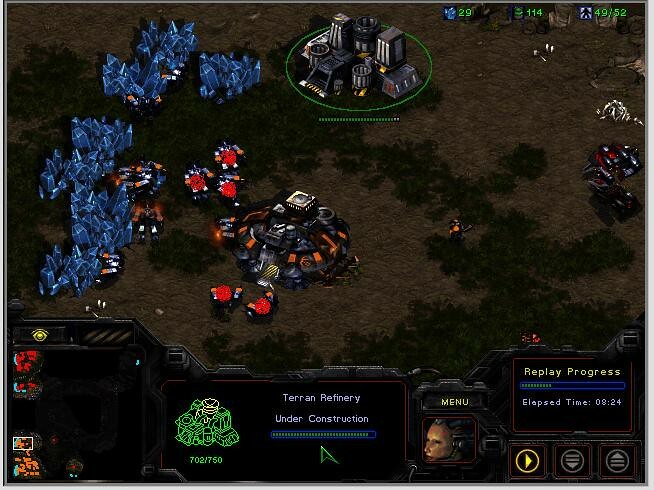 Regarding idol SCVs did you kill an SCV that was building a building leaving it unfinished? There's an issue with the built in micro control where it corrupts SCV behaviour if this happens. If this was the problem then as far as I know this can't be fixed using a script. Looking at it again, I noticed I killed an SCV that was building gas, so that's why your AI was floating so much. I just thought it was unusual because I've never seen that happen even when an SCV is killed, I guess this was a special case since the refinery builder was killed. Why do we always get different replays lol? I've tested Archon_Wing's old replay zv2t_1.49.rep (on page 3 of this thread) running the old Accel_T_1.49 script and it runs correctly, so as far as I can tell my configuration is the same as it was back then. Maybe you could try running it to check whether there's something different with your configuration. Also I'm not sure if the refinery builder being killed explains the problem. The issue I've seen before is with buildings like a barracks building worker being killed but the unfinished building not being destroyed. The AI wouldn't send a worker to finish the building and wouldn't start a new one. Also this results in the AI having lots of idol workers for some reason.